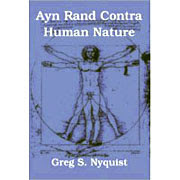 Ayn Rand contra Conservatism 6. Rand, in her essay '“Conservatism: an Obituary” attacks what she calls the “argument from depravity.” Part of her attack involves a curious distortion of the so-called conservative argument, where she draws out a presumed implication of the argument which no conservative would ever endorse. “Please grasp fully the implications of this argument,” abjures Rand: “since men are depraved, they are not good enough for a dictatorship; freedom is all that they deserve; if they were perfect, they would be worthy of a totalitarian state. Now no conservative has ever said anything of the kind, and it is hard to imagine that any ever would. Nor does the conservative argument imply such a thing. There is a conservative (and classical liberal) argument that goes something as follows: that whatever annoyances or defects that can sometimes be associated with representative institutions and a government by checks and balances, these annoyances are a small price to pay for the dangers associated with dictatorship and tyranny. Conservatives accept Lord Acton’s dictum that power corrupts and that absolute power corrupts absolutely. From this tenuous strand, Rand attempts to weave her claim that conservatives believe, or at least imply, that people are not good enough for dictatorship. If conservatism really implied such an absurdity, you would expect more critics of conservatism to have made the charge. But Rand is the only one to have ever made it. She backs it with no quotes from any conservative and, as far as I know, never made the charge again, nor did she ever make it a venue where she could have been challenged by an articulate conservative. What makes Rand’s distortion particularly appalling is that for years she was involved conservative movement, talking with and exchanging correspondence with conservative intellectuals such as Isabel Patterson, Channing Pollock, and Ruth Alexander. She was in a position to know better. Hence, it is difficult not to suspect an element of dishonesty, or at least evasion, in Rand’s accusations. If Rand had been passionately committed to honesty and fair practice, she would not have distorted the conservative argument as egregiously as she did here. This is yet another example of Rand making a great deal of virtuous noise about not engaging in behavior X, and yet wallowing in behavior X all the same. Despite all her histrionic denuciations of dishonesty and evasion, here we find her evading and spewing mendacity with the best of them. This leads us to the third—and the worst—argument, used by some “conservatives”: the attempt to defend capitalism on the ground of man’s depravity. Dictatorship—this theory asserts—believe it or not, is the result of faith in man and in man’s goodness; if people believed that man is depraved by nature, they would not entrust a dictator with power. This means that a belief in human depravity protects human freedom—that it is wrong to enslave the depraved, but would be right to enslave the virtuous. And more: dictatorships—this theory declares—and all the other disasters of the modern world are man’s punishment for the sin of relying on his intellect and of attempting to improve his life on earth by seeking to devise a perfect political system and to establish a rational society. This means that humility, passivity, lethargic resignation and a belief in Original Sin are the bulwarks of capitalism. One could not go farther than this in historical, political, and psychological ignorance or subversion. This is truly the voice of the Dark Ages rising again—in the midst of our industrial civilization. The cynical, man-hating advocates of this theory sneer at all ideals, scoff at all human aspirations and deride all attempts to improve men’s existence. “You can’t change human nature,” is their stock answer to the socialists. Thus they concede that socialism is the ideal, but human nature is unworthy of it; after which, they invite men to crusade for capitalism—a crusade one would have to start by spitting in one’s own face. Who will fight and die to defend his status as a miserable sinner? If, as a result of such theories, people become contemptuous of “conservatism,” do not wonder and do not ascribe it to the cleverness of the socialists. This passage constitutes one of the most embarrassing assemblage of words one is likely to find in all of Rand’s writings. It distorts and mauls the conservative arguments beyond recognition. It demonstrates that when it came to representing ideas and views she disagreed with, Rand suffered from a severe case of narcissism. She was extremely sensitive to any perceived distortions of her own views, but showed no such sensitivity towards others. In the passage quotes above, Rand actually conflates two different conservative arguments: (1) the argument behind the U.S. constitution explicated by James Madison in the Federalist Papers; and (2) the argument against an enlightened dictator. The latent causes of faction are ... sown in the nature of man; and we see them everywhere brought into different degrees of activity, according to the different circumstances of civil society. A zeal for different opinions concerning religion, concerning government, and many other points, as well of speculation as of practice; an attachment to different leaders ambitiously contending for pre-eminence and power; or to persons of other descriptions whose fortunes have been interesting to the human passions, have, in turn, divided mankind into parties, inflamed them with mutual animosity, and rendered them much more disposed to vex and oppress each other than to co-operate for their common good. So strong is this propensity of mankind to fall into mutual animosities, that where no substantial occasion presents itself, the most frivolous and fanciful distinctions have been sufficient to kindle their unfriendly passions and excite their most violent conflicts. But the most common and durable source of factions has been the various and unequal distribution of property. Those who hold and those who are without property have ever formed distinct interests in society. Those who are creditors, and those who are debtors, fall under a like discrimination. A landed interest, a manufacturing interest, a mercantile interest, a moneyed interest, with many lesser interests, grow up of necessity in civilized nations, and divide them into different classes, actuated by different sentiments and views. The regulation of these various and interfering interests forms the principal task of modern legislation, and involves the spirit of party and faction in the necessary and ordinary operations of the government. This policy of supplying, by opposite and rival interests, the defect of better motives, might be traced through the whole system of human affairs, private as well as public. We see it particularly displayed in all the subordinate distributions of power, where the constant aim is to divide and arrange the several offices in such a manner as that each may be a check on the other -- that the private interest of every individual may be a sentinel over the public rights. 2. Argument against an enlightened dictator. I’ll examine Rand’s confusions concerning this argument in my next post. Now consider the second argument: the attempt to justify capitalism on the ground of tradition. Certain groups are trying to switch the word “conservative” into the exact opposite of its modern American usage, to switch it back to its nineteenth-century meaning, and to put this over on the public. These groups declare that to be a “conservative” means to uphold the status quo, the given, the established, regardless of what it might be, regardless of whether it is good or bad, right or wrong, defensible or indefensible. They declare that we must defend the American political system not because it is right, but because our ancestors chose it, not because it is good, but because it is old . . . . The argument that we must respect “tradition” as such, respect it merely because it is a “tradition,” means that we must accept the values other men have chosen, merely because other men have chosen them—with the necessary implication of: who are we to change them? The affront to a man’s self-esteem, in such an argument, and the profound contempt for man’s nature are obvious. The esteem for tradition and customs, of grown institutions, and of rules whose origin and rationale we do not know does not, of course, mean—as Thomas Jefferson believe with a characteristic rationalist misconception—that we “ascribe to men of the preceding age a wisdom more than human, and … suppose they did beyond amendment.” Far from assuming that those who created institutions were wiser than we are, the evolutionary [i.e., conservative] view is based on the insight that the result of experimentation of many generations may embody more experience than one man possesses. We understand one another and get along with one another, are able to act successfully on our plans, because, most of the time, members of our civilization conform to unconscious patterns of conduct, show a regularity in their actions that is not the result of commands or coercion, often not even of any conscious adherence to known rules, but of firmly established habits and traditions. The general observance of these conventions is a necessary condition of the orderliness of the world in which we live, of our being able to find our way in it, though we do not know their significance and may not even be consciously aware of their existence…. It is indeed a truth, which all the great apostles of freedom outside the rationalistic school have never tired of emphasizing, that freedom has never worked without deeply ingrained moral beliefs and that coercion can be reduced to a minimum only where individuals can be expected as a rule to conform voluntarily to certain principles…. It is this submission to undesigned rules and conventions whose significance and importance we largely do not understand, this reverence for the traditional, that the rationalistic type of mind [like Rand] finds so uncongenial, though it is indispensable for the working of a free society. It has its foundation in the insight which David Hume stressed and which is of decisive importance for the antirationalist, evolutionary tradition—namely, that “the rules of morality are not the conclusions of our reason.” Like all other values, our morals are not a product but a presupposition of reason, part of the ends which the instrument of our intellect has been developed to serve. At any one stage of evolution, the system of values into which we are born supplies the ends which our reason must serve. This givenness of the value framework implies that, although we must always strive to improve our institutions, we can never aim to remake them as a whole and that, in our efforts to improve them, we must take for granted much that we do not understand…. In particular, we can never synthetically construct a new body of moral rules or make our obedience of the known rules dependent on our comprehension of the implications of this obedience in a given instance…. There are good reasons why any person who wants to live and act successfully in society must accept many common beliefs, though the value of these reasons may have little to do with their demonstrable truth. Such beliefs will also be based on some past experience but not on experience for which anyone can produce the evidence. The scientist, when asked to accept a generalization in his field, is of course entitled to ask for the evidence on which it is based. Many of the beliefs which in the past expressed the accumulated experience of the race have been disproved in this manner. This does not mean, however, that we can reach the stage where we can dispense with all beliefs for which such evidence is lacking. Experience comes to man in many more forms than are commonly recognized by the professional experimenter or the seeker after explicit knowledge. We would destroy the foundations of much successful action if we disdained to rely on ways of doing things evolved by the process of trial and error simply because the reason for their adoption has not been handed down to us. The appropriateness of our conduct is not necessarily dependent on knowing why it is so…. Rand operates in the rationalist tradition in which everything has to be consciuosly explained and explicitly justified. This is the tradition that dominated the Old Left and provided some of the rationalizations for various left-wing political schemes, including those that led to the Reign of Terror during the French Revolution and the horrors of the Soviet Union. Rand is unique in that she tried to justify capitalism and freedom using the same sort of rationalistic assumptions accepted by the Old Left. She insisted, just like so many of the so-called “scientific” socialists and progressives of the nineteenth and early twentieth centuries, that everything in the political and moral realms had to be explicity justified on the basis of “reason.” But whether used to provide the rationalistic justification of socialism, capitalism, or any other ism that a febrile imagination can dream up, all such rationalisms amount to the same thing: incapacity in the face of the complexities of the human condition. Reverence for tradition is, for the intelligent, non-ideological conservative, merely a tool used to compliment less tacit forms of knowledge, such as science and individual experience. Traditional usages often have proven their worth over time, and should not be tossed out merely become some rationalist fails to explain it by “reason.” The conservative proceeds cautiously when reforming a tradition, because he knows, from long experience, how easy it is to make things worse, and that when faced with any daunting complexity, sheer trial and error is often a far better guide than the so-called “reason” of conceited intellectuals.